Horror, when done right, can stay with you forever. Whether it's the slow creep of Nosferatu's shadow down a flight of stairs, the lightning-fast emergence of a chest-burster, or the gentle rap rapping of an Edgar Alan Poe poem, these are moments that can send both pulses and minds racing. It's not just movies and books that can create true horror, though – games and apps can too. Yes, your friendly-looking Samsung GALAXY S4 or Note 8.0 is just a few app downloads away from offering up the ultimate scare factor. If you're of a nervous disposition, look away now. Originally a cult graphic novel, The Walking Dead made the successful transition from page to screen in 2010 and since then a number of popular games have brought the zombie tale to interactive life. 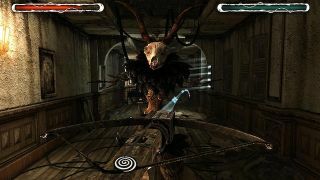 This Android version was released to celebrate the tenth anniversary of the comic, and is a searing slice of survival horror that melds original storylines with 3D visuals. Although the plot may slip into cliché at times – you start off in an abandoned house and have to search each room for valuables – play Eyes for a while and you will be immersed in a lovely slab of haunted horror. It's all in the first person and the 3D graphics are impressive for a free game, so keep your wits about you because there are more than a few scares around each corner. And don't forget that the walls have eyes. Lots of eyes. A decent first-person shooter game on Android is hard to find. One that can scare you rigid is even rarer, which is why Dead Trigger is such a gem of a game. Near console-quality graphics that sparkle on the GALAXY S4 or Note 8.0, alongside furious gameplay that never lets up, Dead Trigger offers a sublime horror experience. It will also equip you with all the knowledge you'll need if the world is ever overrun with zombie hordes, which is nice. If you are a fan of Bioshock's eery steampunk dystopia, then Dark Meadow: The Pact is for you. Given a similar setting, the first-person shooter sets out to shock almost immediately. The game allows you to get acquainted to the easy on-board controls then… bang! You are hit with your first monster. This isn't a game for the faint of heart, but it is great for those who love shocks and scares, quality graphics and who don't mind giving up a whopping 1GB of onboard storage to make way for this expansive game. To be honest, despite its name, we don't think you would manage to stomach much popcorn while using Popcorn Horror. This app is the gateway to a wide selection of horror shorts that you can watch for free on your GALAXY Note 8.0 or S4. Don't expect premium movies here – Popcorn Horror is all about user-generated content. While the thought of this is often enough to fill anyone with dread, don't panic: this app is packed with well-scripted horror and grindhouse movies that manage to instill just as much terror as the latest box-office slasher. Couple this with a creepy community and what you get is a fantastic fear-filled app. Ah, Murder Room. With a name like that, we reckon you may be able to guess what sort of game lies in store. Yup, this app is set in a room where a murder takes place – and a rather grizzly one at that.